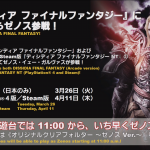 In the fiftieth Letter from the Producer Live broadcast from the Final Fantasy XIV Fan Festival in Tokyo, the team discussed the patches leading up to the Shadowbringers expansion. The first of which will be Patch 4.56, releasing on Tuesday, March 26th. You can read our summary of the major announcements below! — Patch 4.56, A Requiem for Heroes – Part II, will release on March 26th. 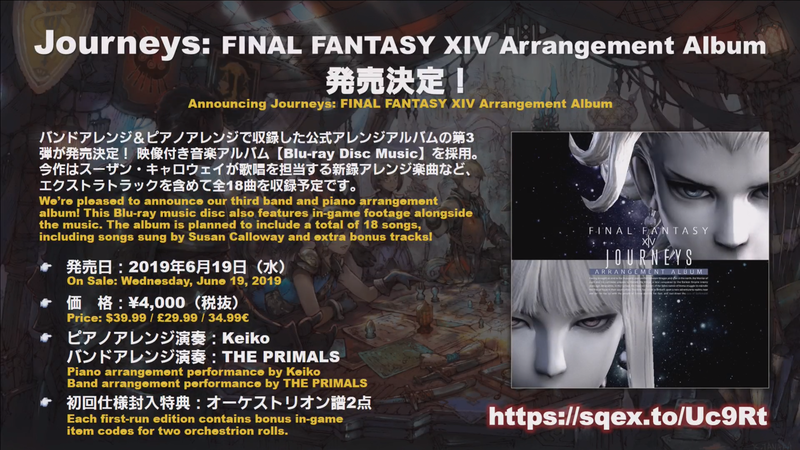 This patch will include new main scenario quests, Even Further Hildibrand Adventures, and the finale of the Beast Tribe Quests. — On April 2nd, the Data Center Expansion for Europe will commence to add the ‘Light’ data center. During this time, the worlds will be reorganized. There will be a two week free transfer period. — On April 16th, ‘A Nocturne for Heroes’ — the Final Fantasy XV collaboration event — will commence. 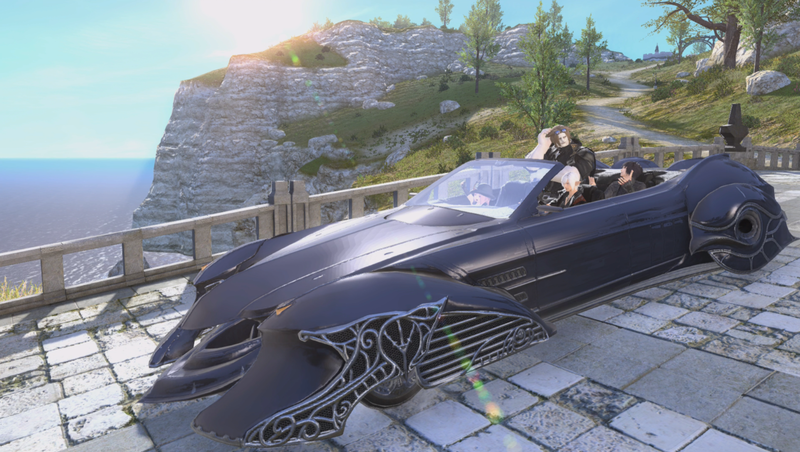 You’ll be able to get hairstyles, equipment, and the four-person Regalia mount. 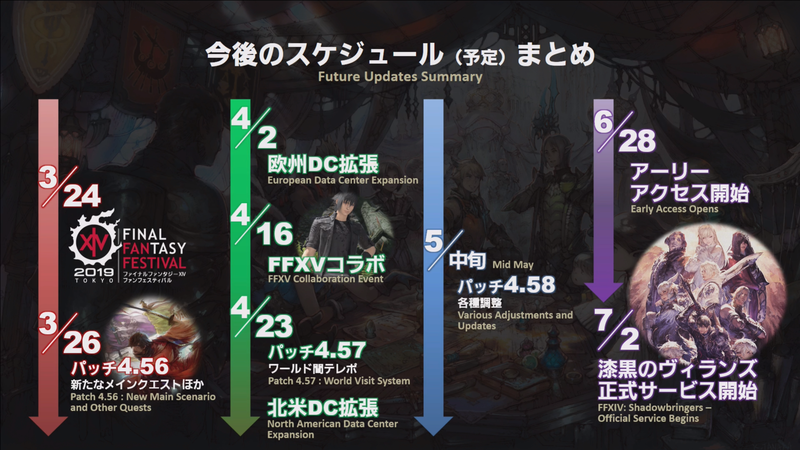 — On April 23rd, Patch 4.57 will release and features the World Visit system in which you will be able to travel to other worlds on your data center. They’re may be glitches so they would like players to report them. — On April 23rd, the Data Center Expansion for North America will commence to add the ‘Crystal’ data center. During this time, the world will be reorganized. There will be a two week free transfer period. — In Mid-May 2019, Patch 4.58 will release, featuring various adjustments and updates. It won’t be new content. 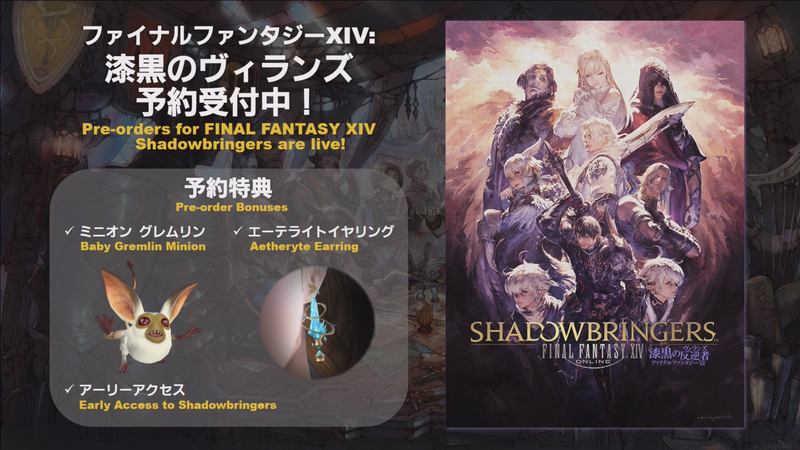 — On June 28th, 2019, Early Access for the Shadowbringers expansion will begin. Pre-order of the expansion is required to participate. 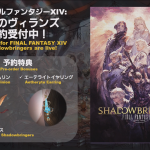 — On July 2nd, official service for Shadowbringers begins. — There will be a benchmark that will allow you to customize Viera and Hrothgar characters. Q: What does a ‘world lore creator’ do? He has two jobs: world lore creator and scenario team lead. With creating the world lore, you have to check a lot of documentation including quest text. As the scenario lead, he comes up with the story ideas and the team will write a scenario accordingly. Yoshida brings the team on a retreat to a hotel where they lay the groundwork for an expansion story. A: He reads a lot of books, documentaries, National Geographic. He cites a book from the 1800s for inspiration for the Namazu. Q: What kind of books to you like the best? Q: What’s a day in the life like for Banri Oda? Checking your email, and then whatever the dev team needs. Thinking up core concepts for the patches. After things are created, I will do checks. After its finalized I will do final checks. In between I will write help text. He works closely with Yoshida in which they have a scenario team meeting every week. Q: Are there any books or movies that you would recommend? A: A lot of things — Thomas Bullfinch’s ‘Legends of Charlemagne’. Weapon names have come from this. Q: What character or story left the big impression? A: He doesn’t want to show favoritism to a character. One event scene he liked was in Stormblood where you play as Alphinaud. Up until that point it was hard to show story beats the Warrior of Light was not involved in. It was something they really wanted to create. 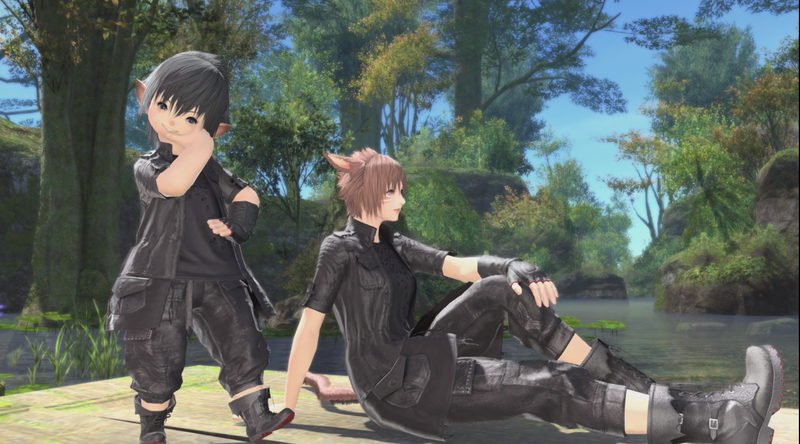 They had to go to Yoshida for permission to do this. The climax of the Namazu beast tribe quests where the screen splits into four. To create this they were four images transposed on a black background with the main character. 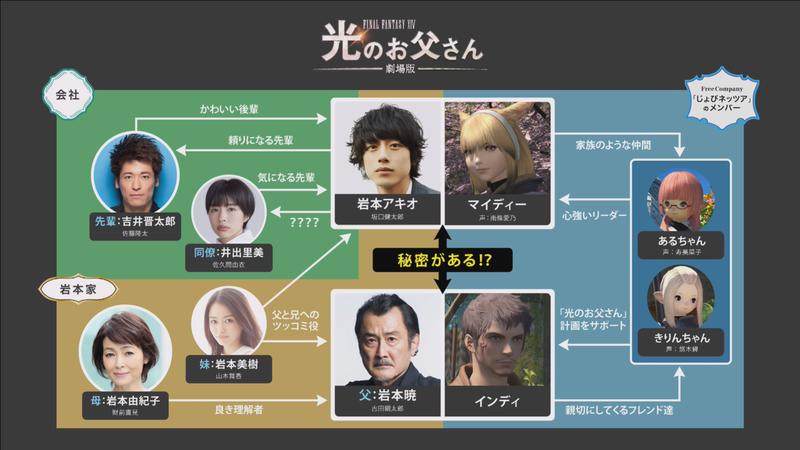 Yoshida says it’s hard to do new things in the main scenario — so you won’t see things we haven’t tried before in it. In sidequests, however, they can test them and see if they’ll work out in the main scenario setting. Now maybe they could use that effect in the Namazu quest in, say, Mahjong. Q: I heard you have weekend retreats with Yoshida to work on the main story? A: It’s a building with a whiteboard. 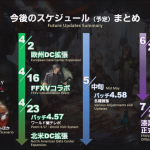 For the 4.0 retreat they decided story content up to 4.2. What did they eat? Ramen. It would be nice if they could go to a resort town, but since you go to an onsen or a romantic place they have men and women on the scenario team. Q: How bad would it be if the Ascians revive Zodiark? A: Depends on your perspective of ‘bad.’ For some characters it would be good, others bad. The expansion may answer some of these questions. For example, the Garleans believe they are in the right and doing good. There will be characters you will relate with and others you wont. Q: Why did Louisoix transport the WoL five years in the future? Why five years? A: He was using a spell that sends you exactly five years in the future, but a spell where the Warrior of Light would be safe. Whether the player feels like it was yesterday or five years — it’s up to you. Q: Did you have the truth about Eureka planned from the start? A: The Isle of Val was introduced in Heavensward, but when the Eureka was decided we ran with it. 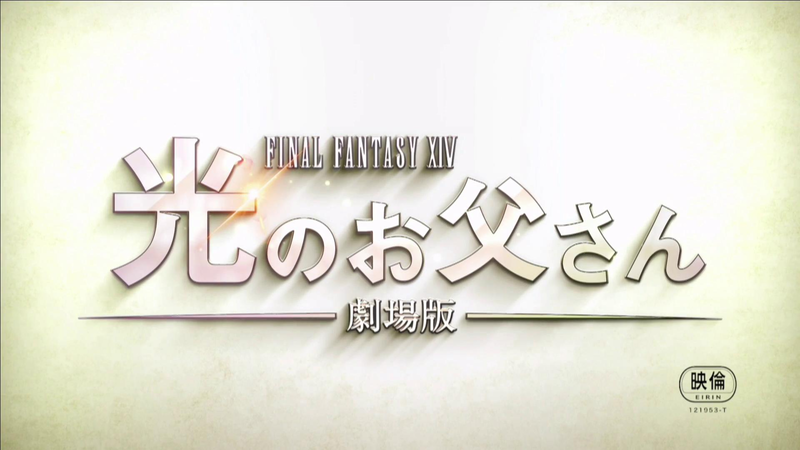 When deciding the 5.0 story involving the Crystal Tower, they decided it was better used in the Eureka content. There were a lot of storylines from 1.0 that ended abruptly so Oda says he will try to find ways to tie them up. 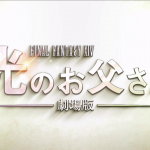 Q: How far along are you in developing the Shadowbringers story? A: It’s about 80-90% but there are side stories and quests that need work. All the voiced scenes are done and all the scenes that connect them are done. They’re up to about the last chapter of the main scenario. 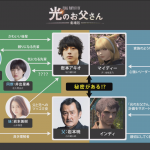 About 90% of them are in the game and Yoshida will be doing checks. Q: In Heavensward, Estinien talks about his blood being half dragon? A: He doesn’t actually have dragon blood but the aether he absorbed from Nidhogg’s Eye. Q: How are NPC birthdays decided? Can you share them? A: Depends on the writer. Some writers will detail their characters’ backgrounds including the birthday. We always have the age but not the birthday. However, once you decide birthdays they you can pin down years which bursts the “Simpsons time bubble” the game takes place in. Q: Is it your job to check lore consistency in different games? A: When I checked the scenario in Dissidia Final Fantasy Opera Omnia I could tell this person played Final Fantasy XIV a lot. 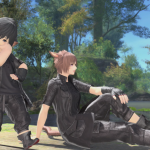 Yoshida says a lot of these collaborations happen recently — when they are approached to collab with Final Fantasy XIV they always come prepared. Q: What does a young Roegadyn look like? A: I also plays a Roegadyn and wanted to know the same thing. I’ve wanted to create that eventually but the development cost is high. He really wants them. Q: Yoshida says the Au Ra rub their horns together to display affection? Is this true? A: Yoshida says he made that up on the spot but he asks if that’s ok. Oda says it’s ok and it’s now official. Q: What is the lettering on the monk and scholar Omega gear? Is it from their home planet? A: It could be language they learned in their travels — it could be a lot of different things. Q: How do you explain the duty finder in lore? How does the boss return? A: You can’t explain it through lore. Maybe you’re experiencing it again in your mind. Oda says he doesn’t worry too much about that. Q: Where does the companion chocobo go when called and dismissed? A: Oda says you shouldn’t think too hard about it. Once you ask that question you start asking how do all of my mounts follow me? Maybe you could think of a creative roleplaying solution. 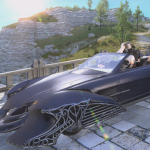 Q: Why can’t the Warrior of Light get to and from the New World? It’s not easily accessible. It’s hard to get there currently. A: A: Maybe once there’s an easy way to get there we can go to the New World. Yoshida says he wants players to someday go there. 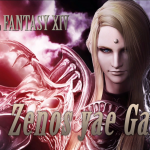 Q: Why didn’t the Eorzeans lose the battle at Ghimlyt of the Garleans outnumbered? 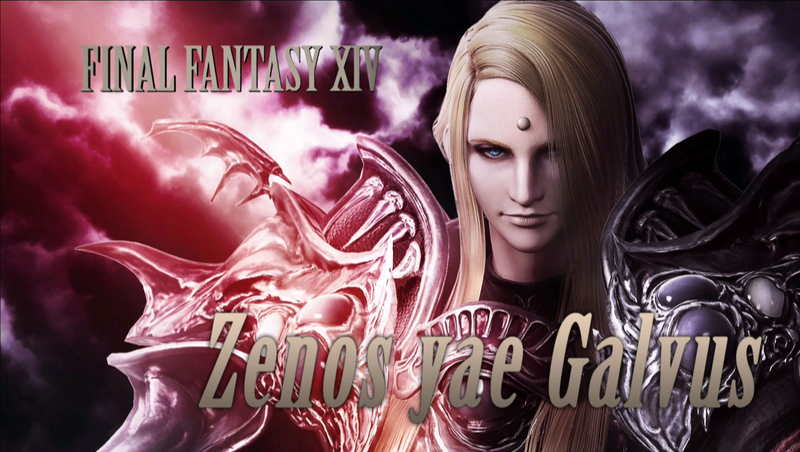 A: Garleans have magitek, but Eorzeans have a realm that allows them to use powerful magic. 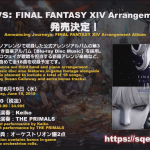 — Journeys Final Fantasy XIV arrangement album announced, includes band and piano arrangements. Releases June 19th, 2019 worldwide. 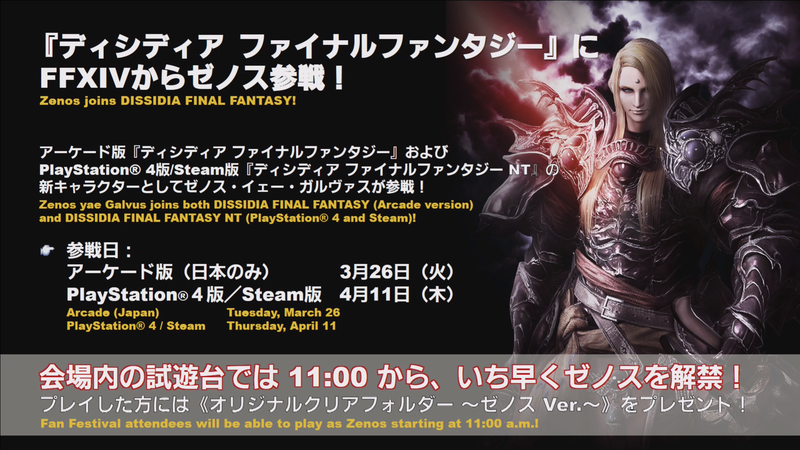 — Zenos yae Galvus is coming to Dissidia Final Fantasy Arcade on March 26th and Dissidia Final Fantasy NT on April 11th. 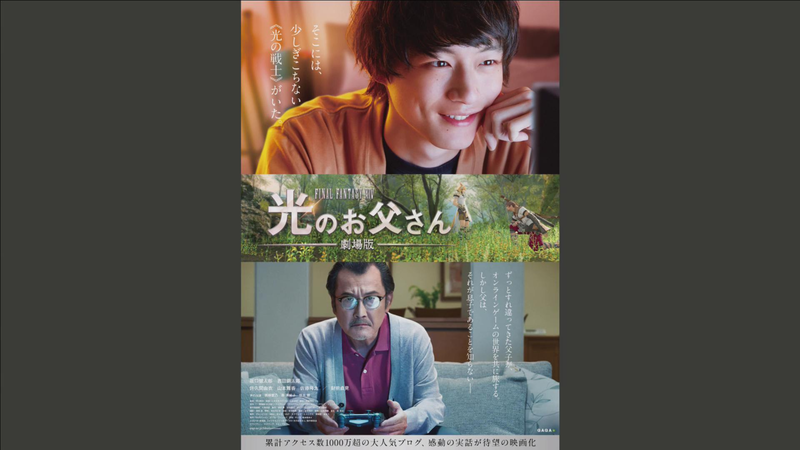 — Dad of Light is being made into a feature-length movie. Production is currently underway. 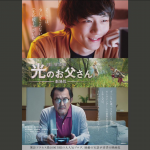 It will release on June 21st, 2019. What do they mean by benchmark for customizing Viera? Shortly before releasing the expansions they bring out a benchmark to test your system with new game changes. In that you have the character creator for the game, but it will include Viera so you can save you options and use them when the expansion releases. I guess I could try viera if I keep my PC I already made.